Sitting down all day is not good for us. Not good at all. 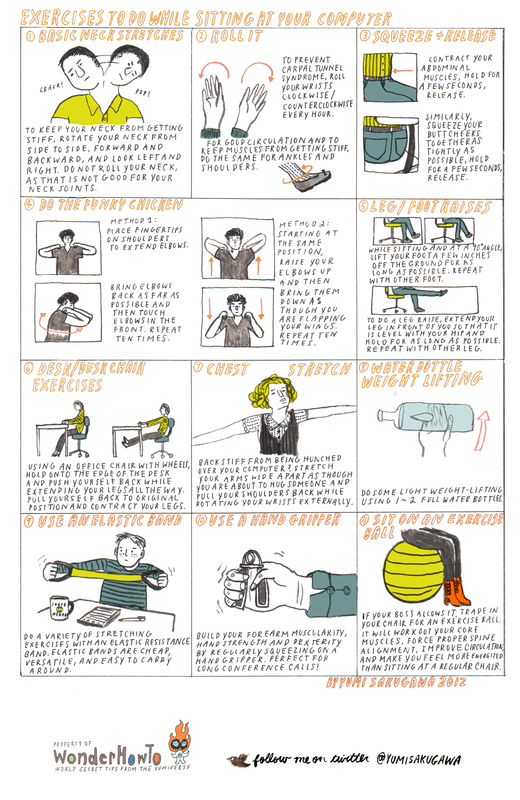 But, even if you're sitting at your desk, there are ways for you exercise different muscle groups to keep active. Stretching your upper body muscles keeps your neck and back from becoming stiff; wrist rolls will help you to avoid carpal tunnel syndrome; and, sitting on an exercise ball (if your workplace will allow it) will help you to engage and work out your core muscles and stabilisers. You're only concern is getting passed the first day when people may look slightly askance at you. But hey, this is your opportunity to lead, right? ;) Number 3 in the info graphic below if really good if you tend to suffer from lower back pain after remaining seated for a while. You can also tilt your tailbone so that you tuck in and draw it towards your tummy, and the push out behind you. Do that 5 times, and then again every 30 minutes or so that you remain seated. It's not a full-work out by any means, but combine this with your walking breaks and it certainly makes a contribution to your wellness. Oh, and make sure you have a bit of room before attempting move number 4!